Hello Everyone! February is here and it is officially the month of Love. I'm linking up with the ladies from The Blended Blog to bring you this month's edition of TBB Q & A. These posts are always so much fun to read and learn about one another. Let's jump right in on the fun! 1) Kisses or Hugs? I love both but if I really had to pick one I would say hugs. A good hug makes everyone feel so much better and it makes you feel as if everything is going to be okay. 2) Candy or Flowers? I prefer Candy. Give me chocolate any day! My favorite is chocolate covered strawberries or Dove chocolates. 4) Do you remember your first kiss? Yes! 6) Conversations Hearts? No, I never have liked the taste of them. 7) Do you leave love notes? Yes, I leave my husband a love note every single morning before he leaves for work. 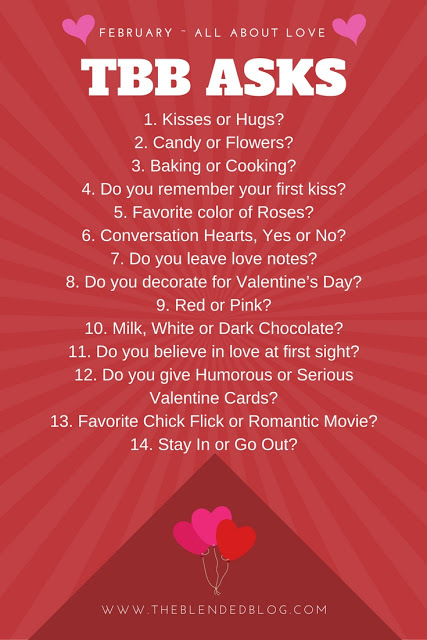 8) Do you decorate for Valentine's Day? Sometimes I do, but this year I didn't. 9) Red or Pink? Both, but I wear more Pink. 10) Milk, White or Dark Chocolate? White Chocolate is my absolute favorite. 11) Do you believe in love at first sight? I fell in love with my son before first sight, but typically no I don't believe in love at first sight as far as relationships go. 12) Do you give Humorous or Serious Valentine Cards? Serious, It's the one time of year to really express your feelings for your significant other. 14) Stay in or Go Out? Just depends on the weather. I'm perfectly content with either one.